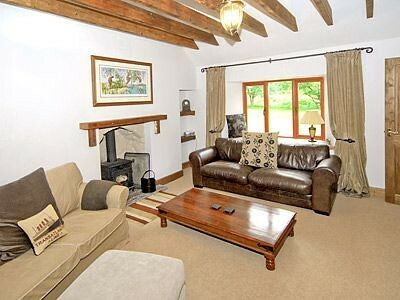 Charming detached cottage in the village of Tarbet, near to Arrochar and close to Loch Lomond. Situated within the Loch Lomond and Trossachs National Park and refurbished and decorated to a high standard, this lovely cottage is the ideal place for exploring this beautiful part of Scotland. You enter through the back door and there is a step up from the porch to the main body of the cottage. You pass the shower room and kitchen, and along the wooden floored hall, passing the double bedroom. The sitting room has a dining alcove and a further king-size bedroom adjoining. A cosy woodburning stove emphasises the attractive original stonework that the owners have made a feature throughout the cottage. The delightful kitchen is the ideal place to rustle up a meal if you don’t fancy eating out. A short walk brings you to the Slanj Bar and Restaurant, a tearoom as well as the Tarbet Hotel. Just across the road from the hotel you can catch a cruise and see Loch Lomond and the spectacular hills surrounding it. This is a paradise for walkers and cyclists, with the famous Arrochar Alps to one side and Loch Lomond to the other! All ground floor. Two bedrooms: 1 x king-size double, 1 x double. Shower room with shower, basin and WC. Kitchen. Sitting room with dining area and woodburning stove. TV with FreeSat, selection of books and games. Lockable bike storage on request. Two well-behaved dogs welcome. Shop 1.5 miles, pub 2 mins walk. Note: The neighbour has a right of access between the back door and the garden. Note: Mobile phone reception is variable at this property. Note: The access track is uneven and requires care. Note: There is one step to access the property.